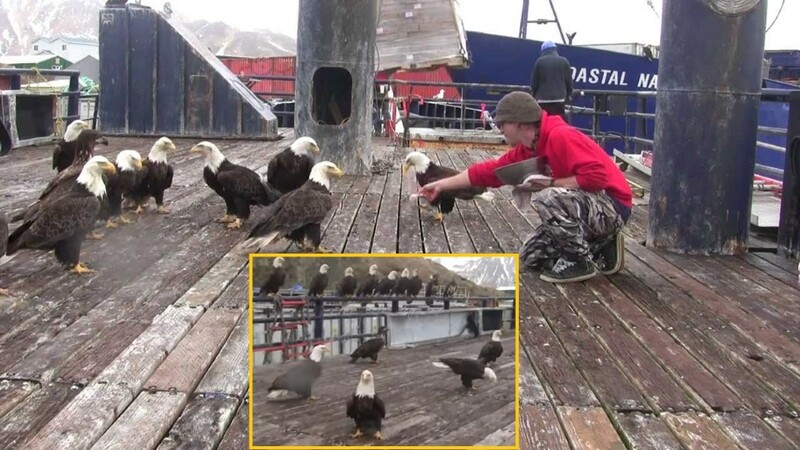 Dutch Harbor, Alaska. Fisherman Jessie Peek has just returned from a successful fishing voyage. He’s unloading his vessel and preparing to go out again. It’s a hard, hard job – but a rewarding one. Alaska is an unforgiving landscape, but one full of beauty. Hey, after all, it’s not everything you get to hang out with a bald eagle, is it?! Or a huge darn flock of ’em! But that’s just what this clip captures Jessie doing. He’s got a tempting bucket of big ol’ juicy shrimps in his hand and the eagles just can’t get enough of them. As he chucks them about, bird after bird comes down to feast. These things are HUGE! Regal too. You can see why so many people revere the bald eagle. And why the United States adopting it as the national animal. We love this clip… Just wait ’til the end though when the camera pans left. Previous articleWOW! This Busker Street Musician Was About To Quit ’til These Little Guys Showed Up! Next articlePreacher Attempts To Baptize A Drunk Guy In The River, But The Dude’s Response?! Hilarious!